Here's something we don't come across too often -- a scalloped Yngwie Malmsteen nylon-string Stratocaster! 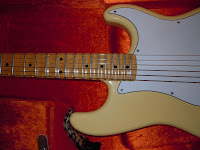 This guitar was made by Fender Japan, who seem to come with all kinds of fun variations on the traditional US Fender models, exclusively for the Japanese market. 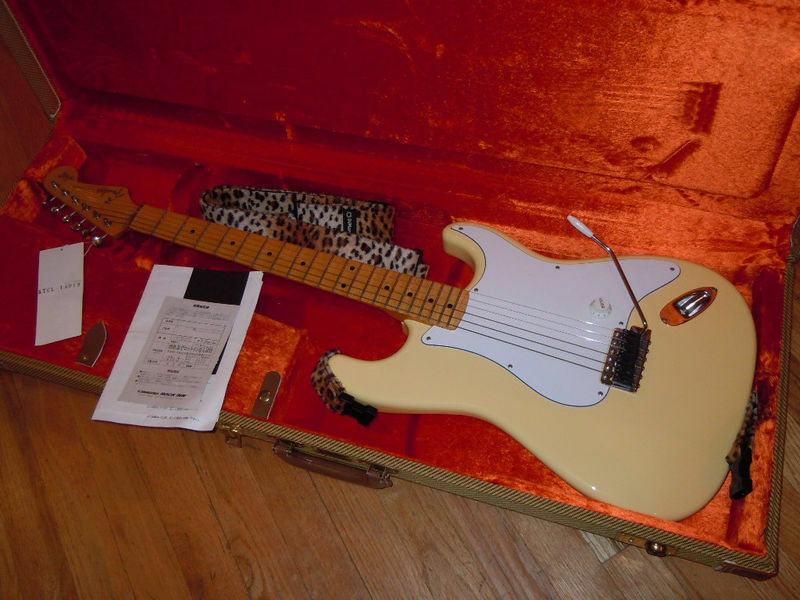 This particular guitar, listed in the Japanese Fender catalog as model STCL-140YM, features what appears to be GraphTech's Ghost pickup system and a single volume control. No fancy parametric EQs here. And from the sound of it, it doesn't need one. Although it must be a real pain stringing up the nylon strings onto the Fender Kluson-style machine heads. Nylon strings are extremely stretchy when new, and before you know it you would have more wraps than those tiny tuning posts can accomodate. You really have to underestimate for the amount of string slack you will need to use when stringing up this baby, especially on the plain nylon treble strings! Check out the eBay listing for this rare bird. And here's an earlier post on a Fender Yngwie Double-neck Stratocaster! Like I said, all kinds of fun variations.. I like the signature strat. Fine looking body with the scalloped neck and all, I just don't like Yngwie Malmsteen.